Participants learn skills from the Sheriff’s team. 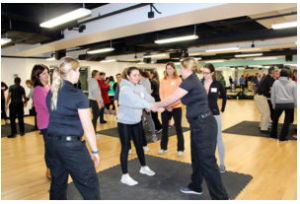 On Jan. 22, Worcester County Sheriff Lewis Evangelidis teamed up with the Vanessa T. Marcotte Foundation for the second time, presenting a workshop which was designed to teach women self-defense moves that he hoped they would never need to use. The workshop was held at the Boroughs Family Branch YMCA of Central Mass. in Westborough. Approximately 40 women participated in this workshop and others are being planned. “It was a lot of fun and I learned a lot,” stated participant Maria Sheehan. Caroline Tocci, founder of the Vanessa T. Marcotte Foundation, started the foundation in 2017. Tocci is a cousin of Marcotte, a 27-year-old who was tragically murdered on a walk near her family home in Princeton in August 2016. “We knew we needed to honor Vanessa but also do something to help other women and to prevent this from happening, which is what Vanessa would have wanted,” Tocci said. The foundation has been hosting self-defense workshops and fundraisers to promote female safety and gender equality and to work on societal issues of harassment against women. “It’s been amazing to have the support of the Worcester County Sheriff’s Office. They’ve spent countless hours planning and training for these workshops and we are really grateful to have them work with us and promote our mission,” Tocci said. “That’s what we want to accomplish and we couldn’t do it without the Marcotte Foundation and without the incredible staff that we have in our office,” Evangelidis added. Lieutenant Michelle Stone was one of about 10 officers on hand to help teach self-defense moves in one-on-one and small group instruction. “It’s amazing how tragedy leads to something like this….It teaches you to be self-aware and how to protect yourself when you are out in the public eye,” she shared. Vanessa’s parents, Rosanna and John Marcotte, were also present and accepted a $250 donation from the Worcester County Sheriff’s Department. For more information about future workshops, contact Kim Roy at 508-796-0344 or visit www.worcestercountysheriff.com. For information about the Vanessa T. Marcotte Foundation, visit www.vanessatmarcottefoundation.org.